When it’s cold outside, indoor snow activities are a fun way to enjoy winter with the kids without getting frozen toes. One morning the kids woke up to a snowy winter wonderland, eager to pop on their boots and get outside. The problem? It was 5 am. The solution? Indoor snow play. I scooped up some snow from the fire escape, brought it inside and spread it out on baking sheets. The boys created a snowy world for their transportation. 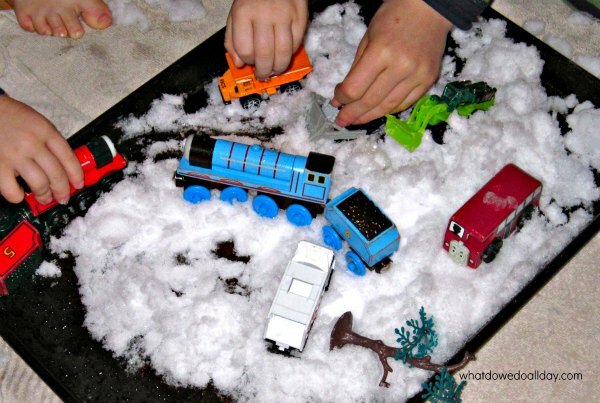 We’ve brought snow inside before but anytime I can include toy vehicles in an activity it is sure to be a hit. The trucks with plows or scoopers saw a lot of action! Be sure to set towels down, but don’t worry, it’s just water so clean up is easy. Free: no fee for the white stuff! Sensory Exploration: snow is cold and wet! Observation of Nature: snow melts into water when you bring it inside. Parent-free Entertainment: I love to enjoy my morning tea in peace with just a little background noise, don’t you? Teaches Responsibility: kids can clean it up themselves. No snow where you live? 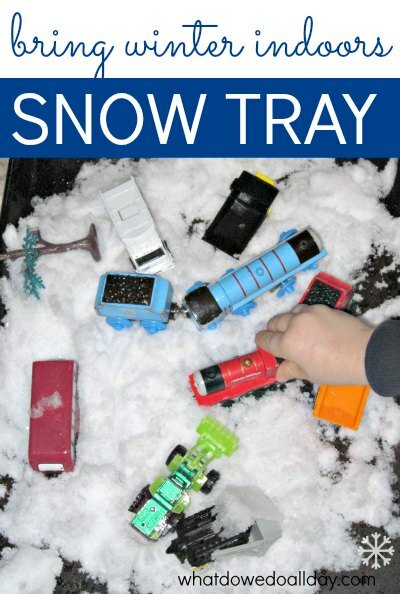 Try a rice sensory tray with cars or an exploding car wash.
Of course every indoor snow activity needs a little reading time, wouldn’t you agree? Take a peek at my 5 favorite snow books for kids. Ah, if only that would work…. Whatever keeps me sane at 5am…. What fun! I pinned it to my Children’s Book Activity board with a suggestion to pair with Katy and the Big Snow! Great activity! We just brought snow inside and have been playing with it all week. I am excited about writing it up. Found you through Little Bins for Little Hands link up. I never thought to use our trains with snow! I love this idea! And I just so happen to be looking at a yard full of snow 🙂 Looks like we have the perfect afternoon activity! Pinned!